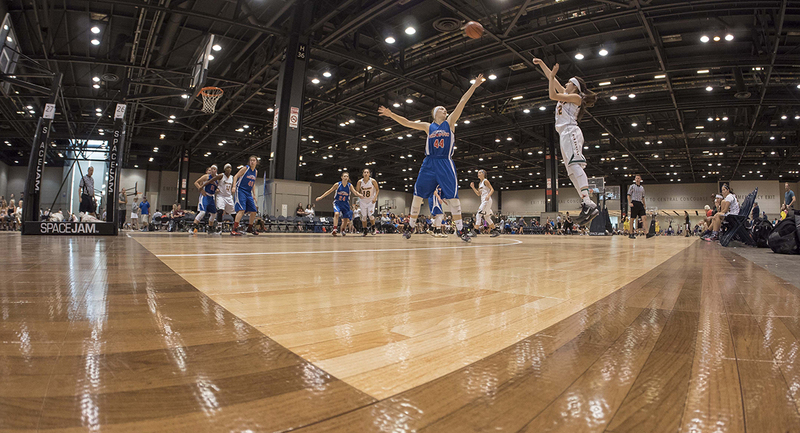 If you plan to host a variety of sports or a variety of teams, you need courts capable of hosting basketball, tennis, volleyball, futsal, roller hockey, netball, and handball. That’s not to mention you’ll need to find a court that can withstand heavy-duty play. That’s why we make our courts durable and versatile, allowing for rapid sport-to-sport transition. Through all of that play, our flooring delivers consistent ball bounce and provides shock absorbance to reduce injuries. We design our courts to provide low life-cycle costs, easy maintenance, and outstanding value for years to come. Our certified CourtBuilders™ can install high-performance courts quickly and efficiently without adhesives. We also combine the safest court technology in the world with eco-friendly materials to make your recreational areas the best for your communities and the environment. Whether you're hosting the volleyball playoffs of the state basketball championships, you can rest easy knowing that every player that goes on your court is playing on the Safest Court in the World™. Our patented Lateral Forgiveness™ and superior shock absorption technology ensures that every player that's on your court can focus on playing the game, and not on their injuries. Contact your local CourtBuilder to find out more about getting Sport Court surfaces for your pay-for-play facility.